Seattle's unique land use code allows developers to place large numbers of townhomes on individual parcels of land that previously contained single-family homes. This was quite lucrative for developers, which led to many cookie cutter faux-craftsmen developments. 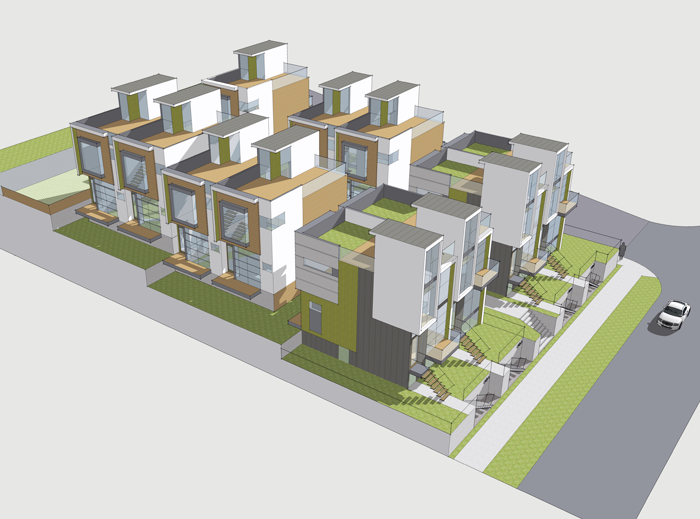 While this development takes advantage of the Seattle land use codes, it seeks to create a better variation of the townhome development by offering a higher quality aesthetic and more creative unit types. I worked on this project while employed at Greyscale Architecture + Design. My roles on this project included collaborating on the design, creating the construction documents, analyzing the zoning requirements, coordinating with engineering consultants, and managing the permitting process. All imagery on this page was completed by myself (except where noted), and remains the intellectual property of Greyscale Architecture + Design. Aerial perspective. Modeling by Scott Rae.